About a corrupt policeman Bruce Robertson (James McAvoy). He plots and schemes to get ahead in the police force. He despises his colleagues and his boss (John Sessions) and his arch rival (Imogen Poots). He drinks hard, takes drugs and is into sexual abuse. His wife and child leave him. He goes to brothels in Henbury with Eddie Marson whom he corrupts. He uses his membership of the freemasonry to get ahead. He descends into hell even further. Will he be rescued by love…? Insofar as it’s drugs in Scotland it seems a partial throwback to Trainspotting, which itself owed a lot visually to William Burrough’s Naked Lunch. Robertson’s drug visions get creepier as he descends into a deep pit of solipsistic mayhem fuelled by alcoholic guilt and self loathing. He feels responsible for the death of his brother from a heap of coal. He seeks release in facile self-serving put downs of his colleagues. In one hilarious scene he imagines his colleagues in degrading scenarios, their faces in close up going from portraits by Lucian Freud to Francis Bacon. As you’d expect amidst the relentless scatalogical grind there is a lot of repetition which gets wearisome. McAvoy gurns his face and manically laughs in a repeat of his performance in Trance. 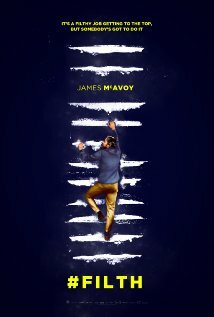 After a while you feel you’ve been sharing the drink and drugs with McAvoy. The screen jumps about like a Danny Boyle on amphetamines. We’ve seen so many cynical cop movies that a policeman wallowing in a moral sewer is hardly remarkable. Filth attempts to make some poignant contrasts between Robertson’s psychic disintegration and the beauty of a snow swept Scottish town ornamented with innocent Christmas songs. If Sunshine on Leith is the lyrical possibility of Edinburgh then Filth is like a pilot for the ultimate bad cop. His nihilism is mildly funny but only in an obvious way as he snivels his way to hope of redemption from the usual grounded good woman as Madonna. Jim Broadbent usually plays Jim Broadbent, and here he does a sort of bad Woody Allen turn as an Australian psychiatrist. Eddie Marson is the classic wimpy husband abused by his bored wife, the characters and the story are punchy but after a while you feel you’ve been flattened.